Decorate a fireplace that's in your ceremony or reception area to become a part of your wedding decor. Fireplaces tend to add a romantic ambiance to a room by themselves; but they can add even more if you decorate the mantel to complement the rest of the wedding decor. The size and style of the fireplace, along with your wedding colors and theme, will play a part in determining the right way to decorate. Use items such as tulle, a string of small lights, silk ivy or other items that can be lain across the mantel as a base. These items should be arranged around other items, but spread out first to anchor the decorative arrangement. 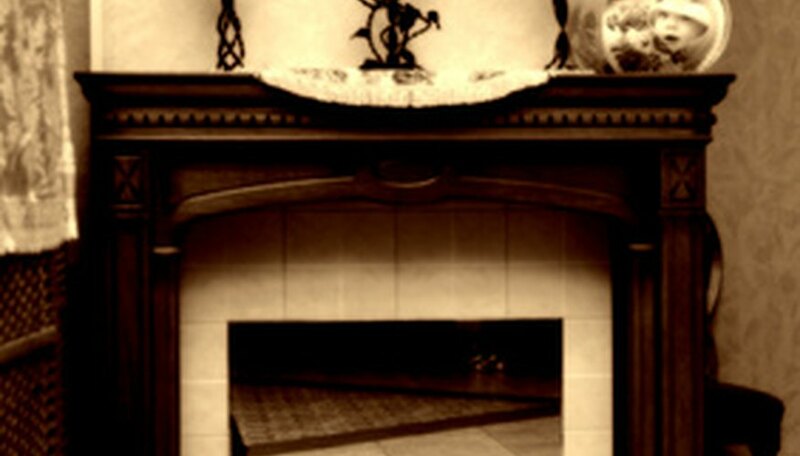 Create a background above the fireplace mantel. Hang a mirror or wreath, such as a wreath in the shape of your monogram. If you can't hang anything above the mirror, consider using a large framed piece, such as a mirror or picture, to lean against the wall on top of the mantel. Add the main pieces to the mantel to complete the decor. For example, place pillar candles, particularly LED candles that won't catch fire, in groups on attractive candle holders or inside glass hurricanes. Framed pictures of the couple or the couple's families' weddings, could line the mantel as well. Decorative vases, flowers or large glass jars filled with decorative items, such as glass ornaments or colorful marbles, are other options. Position or weave the base item around the other decorative items. The sides can hang off of the mantel, like holiday garland, or cover only the mantel. Use items and colors that complement your wedding theme. For example, if you're having a summer wedding with yellow and green colors, consider filling clear jars with sliced lemons and limes. Strings of lights can be wrapped inside light fabrics, such as organza or tulle, for a different effect. If the fireplace isn't lit, add decor to the hearth that complements the mantel. Candles add a touch of romance for evening weddings, although they may be ineffective for earlier weddings. If you're getting married earlier in the day, consider placing mirrors behind the candles for more of an effect or using lights or other items instead.